Anthem: "Saint Vincent Land so Beautiful"
Saint Vincent and the Grenadines is an island nation in the Windward Islands of the Lesser Antilles, an island arc of the Caribbean Sea in North America. The country consists of the main island of Saint Vincent and the northern two-thirds of the Grenadines, a chain of small islands stretching south from Saint Vincent to Grenada. It occupies a total area of approximately 150 square miles (389 square kilometers), of which the island of Saint Vincent constitutes 133 square miles (344 sq km). The country's capital is at Kingstown on Saint Vincent. The country has a British colonial history and is now part of the Commonwealth of Nations and CARICOM. The islands' proximity to South America has influenced its culture, as has its native peoples, East Indians, Africans, and the British who settled the islands. Similar to other Caribbean islands, it has a history of being ravaged by hurricanes. It is also home to an active volcano, the Soufriere. However, also similar to other islands in the area is its paradise-like environment, home to diverse ecosystems and resplendent with landscapes of brilliant flora and beautiful, crystal clear waters. Though the islands' history involved slavery and servitude as well as European colonialism, today's inhabitants focus not on past injustices, but on the richness described in the old Carib name, Land of the Blessed. What is now St. Vincent and the Grenadines was known by the Carib people as Hairoun, meaning "Land of the Blessed," for its lush mountains, rich soil, and marine resources. The environment provided richly for these native peoples. The islands are home to the oldest botanical gardens in the Western Hemisphere, which contain rare and exotic flowers, plants, and trees. Founded in 1762, the gardens began as a commercial enterprise for plants brought from around the world. 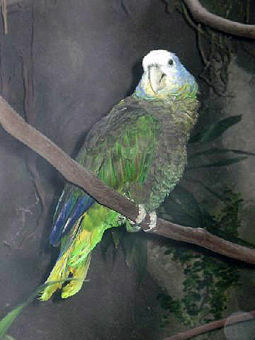 An aviary offers home to a number of bird species, including the national bird, the majestically colored St. Vincent parrot (Amazona guildingii). The main island of Saint Vincent and the Grenadines is Saint Vincent. Its geography is mostly volcanic and mountainous and includes very little level ground. There is a large difference between the coastlines on each side of the island; the windward side is very rocky, while the leeward side consists of many sandy beaches and has many more bays. The island's, as well as the country's, highest peak is the volcano Soufrière at 4,048 feet, and its lowest point is at sea level. There are several tiny islets offshore of Saint Vincent, including Young Island and the Cow And Calves Islands. Saint Vincent and the Grenadines also include hundreds of smaller islets. The remainder of the Grenadines to the south are administered by Grenada. Saint Vincent and the Grenadines are located in the Caribbean Sea just north of Trinidad and Tobago and east of Central America. Geographically, it rests at 13°15′N 61°12′W and is twice the size of the city of Washington, D.C. The islands encompass 241 square miles of land area and 52 miles of coastline. Its maritime claims are 24 nautical miles in a contiguous zone, 200 nautical miles in continental shelf and exclusive economic zones, and 12 nautical miles of territorial sea. The islands have a tropical climate with little seasonal temperature variation, and a rainy season that runs from May to November. Natural resources of the islands include hydropower and cropland. Only 10 percent of the land is arable, 18 percent contains permanent crops, 5 percent is being used as permanent pastures, 36 percent is forest and woodland, and the remaining 31 percent is used in various other activities (per a 1993 estimate). Six square miles are irrigated land, according to the same estimate. Natural threats are hurricanes and the Soufriere volcano is a constant natural hazard. Current environmental issues include the pollution of coastal waters and shorelines from discharges by pleasure yachts and other effluents. In some areas, pollution is severe enough to make swimming prohibitive. 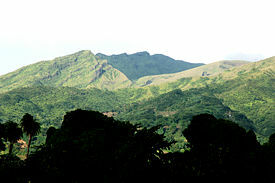 Volcanic Soufrière (1,234 m), Saint Vincent and the Grenadines highest point. Carib Indians aggressively prevented European settlement on St. Vincent until the eithteenth century. Enslaved Africans—whether shipwrecked or escaped from Barbados, St. Lucia, and Grenada, and seeking refuge in mainland St. Vincent—intermarried with the Caribs and became known as Garifuna or "Black Caribs." Beginning in 1719, French settlers cultivated coffee, tobacco, indigo, cotton, and sugar on plantations worked by enslaved Africans. In 1763, St. Vincent was ceded to Great Britain. Restored to French rule in 1779, St. Vincent was regained by the British under the Treaty of Paris (1783), in which Great Britain officially recognized the end of the American Revolution. Ancillary treaties were also signed with France and Spain, known as the Treaties of Versailles of 1783, part of which returned St. Vincent to British control. Conflict between the British and the Black Caribs, led by defiant Paramount Chief Joseph Chatoyer, continued until 1796, when General Sir Ralph Abercromby crushed a revolt fomented by the French radical Victor Hugues. More than 5,000 Black Caribs were eventually deported to Roatán, an island off the coast of Honduras. Slavery was abolished in 1834. The resulting labor shortages on the plantations attracted Portuguese from Madeira in the 1840s, and shiploads of East Indian indentured laborers arrived between 1861-1880. Conditions remained harsh for both former slaves and immigrant agricultural workers as depressed world sugar prices kept the economy stagnant until the turn of the century. During this period, the British made several unsuccessful attempts to affiliate St. Vincent with other Windward Islands in order to govern the region through a unified administration. The colonies themselves, desirous of freedom from British rule, made a notable attempt at unification called West Indies Federation, which collapsed in 1962. St. Vincent was granted associate statehood status on October 27, 1969, giving it complete control over its internal affairs. Following a referendum in 1979, under Milton Cato, St. Vincent and the Grenadines became the last of the Windward Islands to gain independence, on the 10th anniversary of its associate statehood status, October 27, 1979. Natural disasters have featured in the country's history. In 1902, La Soufrière volcano erupted, killing 2,000 people. Much farmland was damaged, and the economy devastated. In April 1979, La Soufrière erupted again. Although no one was killed, thousands had to be evacuated, and there was extensive agricultural damage. In 1980 and 1987, hurricanes compromised banana and coconut plantations; 1998 and 1999 also saw very active hurricane seasons, with Hurricane Lenny in 1999, causing extensive damage to the west coast of the island. Saint Vincent and the Grenadines is a full member of the OECS.. Politics of Saint Vincent and the Grenadines takes place in the framework of an independent parliamentary democratic Commonwealth Realm, with Queen Elizabeth II as its head of state, represented by a Governor General, who acts on the advice of the prime minister and the cabinet. The prime minister is the leader of the majority party of the house, and the cabinet conducts affairs of state. The Governor General exercises basically ceremonial functions, but residual powers, under the constitution, can be used at the Governor General's discretion. The House of Assembly of Saint Vincent and the Grenadines is a unicameral parliament with 15 elected members and six appointed senators. The governor general appoints senators, four on the advice of the prime minister and two on the advice of the leader of the opposition. The parliamentary term of office is five years, although the prime minister may call elections at any time. As in other English-speaking Caribbean countries, the judiciary in St. Vincent is rooted in English common law. There are eleven courts in three magisterial districts. The Eastern Caribbean Supreme Court, comprising a high court and a court of appeals, is known in St. Vincent as the St. Vincent and the Grenadines supreme court. The court of last resort is the judicial committee of Her Majesty's Privy Council in London. Moves are currently being made to establish a Caribbean Court of Justice and replace the Privy Council as the country's highest court of appeal. There is no local government in St. Vincent, and all six parishes are administered by the central government. The country has no formal armed forces, though Royal Saint Vincent and the Grenadines Police Force includes a Special Service Unit. Administratively, Saint Vincent and the Grenadines is divided into six parishes, with five on Saint Vincent, and the combined Grenadines forming the sixth. 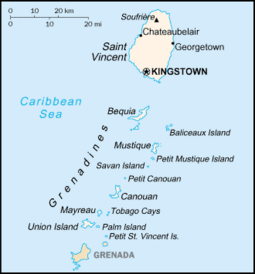 Kingstown is located in the Parish of St. George and is the capital city and central administrative center of the nation. Saint Vincent and the Grenadines maintains close ties to the U.S., Canada, and the United Kingdom, and are a full and participating member of the Organization of Eastern Caribbean States (OECS) and CARICOM. St. Vincent and the Grenadines is a member of the United Nations, the Commonwealth of Nations, the Organization of American States, and the Association of Caribbean States (ACS). As a member of CARICOM, St. Vincent and the Grenadines strongly backed efforts by the United States to implement UN Security Council Resolution 940, designed to facilitate the departure of Haiti's de facto authorities from power. The country agreed to contribute personnel to the multi-national force, which restored the democratically elected government of Haiti, in October 1994. In May 1997, Prime Minister Mitchell joined fourteen other Caribbean leaders and U.S. President Bill Clinton during the first-ever U.S.-regional summit in Bridgetown, Barbados. The summit strengthened the basis for regional cooperation on justice and counter-narcotics issues, finance and development, and trade. St. Vincent and the Grenadines maintains close relations with Cuba, which provides a number of scholarship and other exchange programs for Vincentians, particularly in the field of healthcare. It also has diplomatic relations with the Republic of China (Taiwan) instead of the People's Republic of China. Saint Vincent protests Venezuela's claim to give full effect to Aves (Bird) Island, which creates a Venezuelan continental shelf extending over a large portion of the Caribbean Sea. Saint Vincent is a trans-shipment point for South American illicit drugs destined for the U.S. and Europe. The St. Vincent economy is heavily dependent on agriculture. Crops include carrots, cassavas, coconuts, sweet potatoes, and yams. It is also the world's largest producer of arrowroot. However, the largest crop is the banana, which accounts for nearly 60 percent of the work force and 50 percent of merchandise exports. Such strong reliance on a single crop makes the economy vulnerable to external factors. St. Vincent's banana growers have benefited from preferential access to the European market. In view of the European Union's announced phase-out of this preferred access, economic diversification is a priority. Tourism has grown to become a very important part of the economy. In 1993, tourism supplanted banana exports as the chief source of foreign exchange. The Grenadines have become a favorite of the yachting crowd. The trend toward increasing tourism revenues will likely continue. In 1996, new cruise ship and ferry berths were completed, sharply increasing the number of passenger arrivals. In 1998, total visitor arrivals stood at 202,109 with United States visitors constituting 2.7 percent, as most of the nation's tourists are from other countries in the Caribbean and the United Kingdom. Most Vincentians are the descendants of African slaves brought to the island to work on plantations. There also are a few white descendants of English colonists and Portuguese migrants, as well as some East Indians, Carib Indians, and a sizable minority of mixed race. The country's official language is English. French Creole was once widely spoken, but has been in sharp decline. 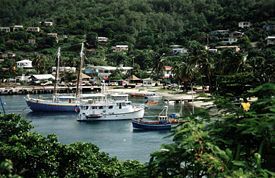 A French patois may be heard on some of the Grenadine Islands. St. Vincent has a high rate of emigration. With extremely high unemployment and under-employment, population growth remains a major problem. ↑ Central Intelligence Agency, St Vincent and the Grenadines The World Factbook. Retrieved October 20, 2016. ↑ 2.0 2.1 2.2 2.3 International Monetary Fund, St. Vincent and the Grenadines Retrieved October 20, 2016. CIA World Factbook. Saint Vincent and the Grenadines. Retrieved October 20, 2016. US Dept of State Country Profiles. Background Note: Saint Vincent and the Grenadines. Retrieved October 20, 2016. Gonsalves, Ralph E. History and the Future a Caribbean Perspective. St. Vincent. s.n. 1994. Jinkins, Dana, Jill Bobrow, Margaret Eleanor Atwood, Graeme Gibson, and Raquel Welch. St. Vincent and the Grenadines Bequia, Mustique, Canouan, Mayreau, Tobago Cays, Palm, Union, PSV: A Plural Country. Stockbridge, MA: Concepts Pub., 1985. ISBN 0393033090. Williams, Eric Eustace. British Historians and the West Indies. New York: Africana Pub. Corp., 1972. ISBN 0841900884. St. Vincent Paper Money. NumisMondo. Official website of the Government of St. Vincent and the Grenadines. History of "Saint Vincent and the Grenadines"
This page was last modified on 20 October 2016, at 19:41.